Welcome to the exciting world of geocaching! 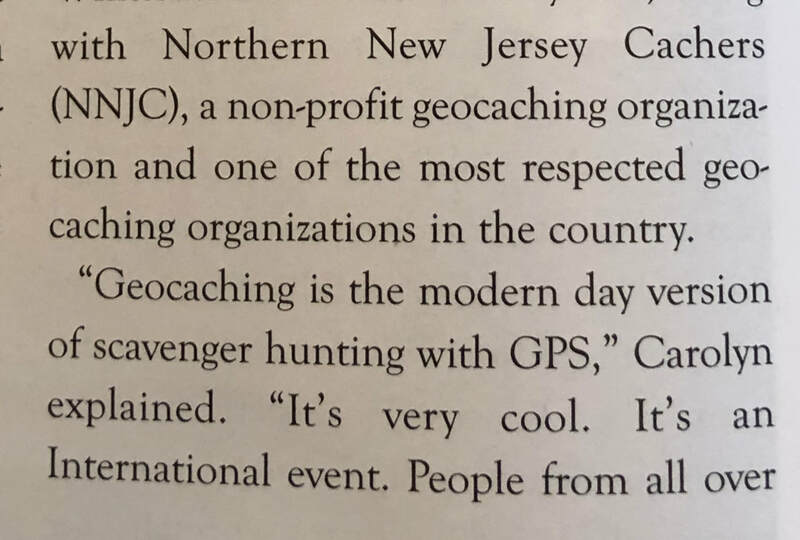 On behalf of the officers of the Northern New Jersey Cachers (NNJC), a non-profit geocaching organization, we would like to invite you to look into and join our organization. 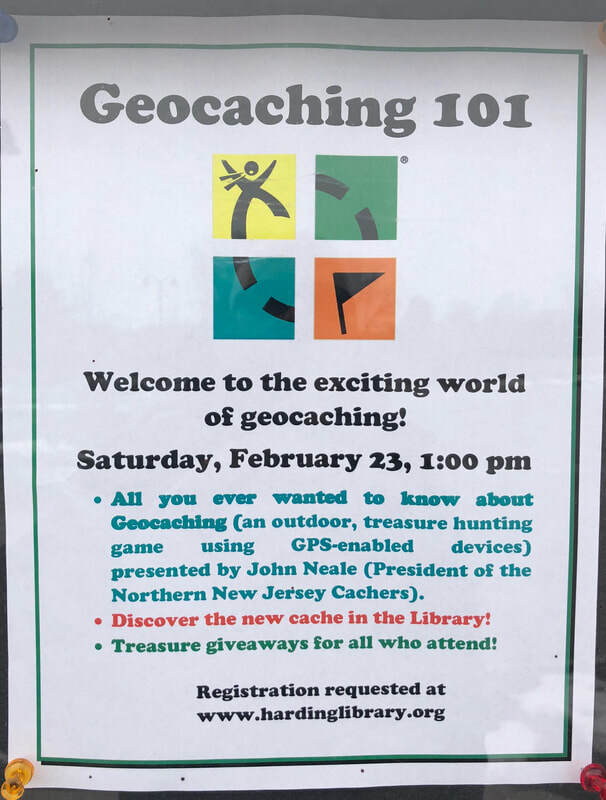 The purpose of our organization is to promote, communicate and provide general information about the growing sport of geocaching in New Jersey. We have included a new Log in / Registration tab for anyone interested in becoming member to join NNJC. Please see info on this page, and help support NNJC! THIS IS ALSO FOR ALL EXISTING MEMBERS, please register with your email information. We are a group, comprised of geocachers from all over the tri-state area with the common goal of enjoying quality geocaching in Northern New Jersey. Since 2005, NNJC has promoted this sport and helped bring together a community of people from all walks of life, and by providing resources to those just starting out! Through our NNJC website you can discover area meet and greets, caching events, milestones, popular caches, frequently asked questions and contacts for other cachers in your area. NNJC meets the First Monday of each month in Parsippany, everyone is welcome to attend the gathering. Whether geocaching becomes your hobby, sport, activity or obsession, we want to welcome you and offer any assistance we can, as you become part of our geocaching community. Membership is free join and become part of a local and tight-knit geocaching community with the same active interest of geocaching in New Jersey. Register at our Facebook and Instagram social media sites. All we ask, is that you spread the word about geocaching, and again welcome aboard! If you have any questions, feel free to let us know on our Contact us page. 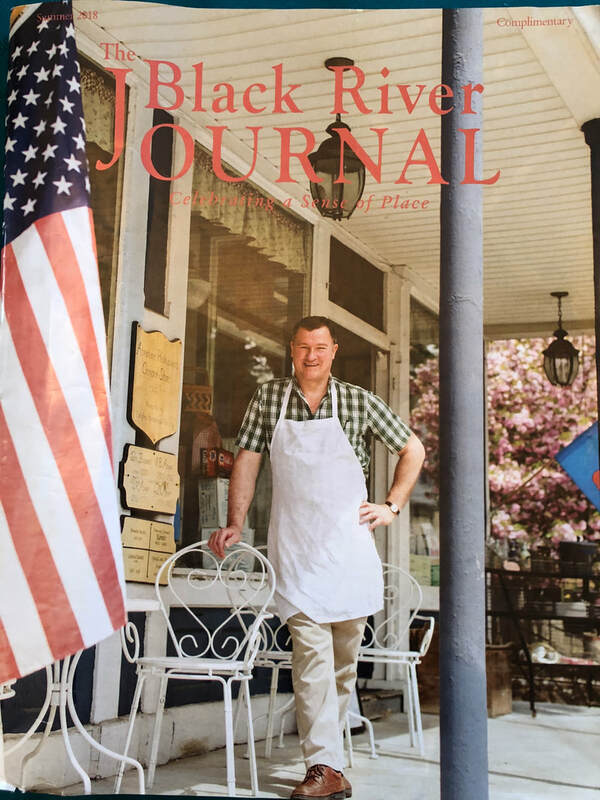 John Neale, ~ "Old Navy"
Welcome to the new Log in / Registration (FREE) for anyone who wants to join and become a member of NNJC. This is also for existing "members" please register your information! 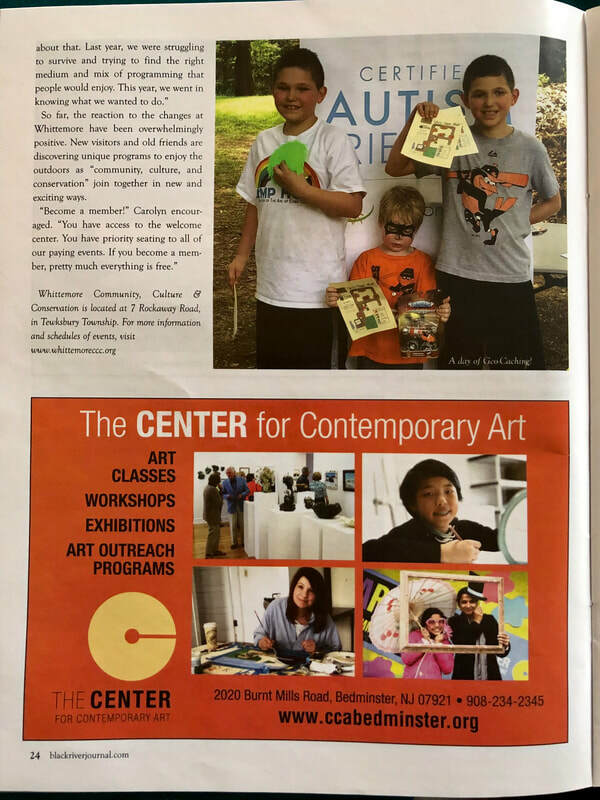 By registering at the tab above you will become​ a member and receive email notifications of events, and the future newsletter! NNJC is getting through winter like most of us wanting spring to arrive so we can get out and enjoy some spring weather. 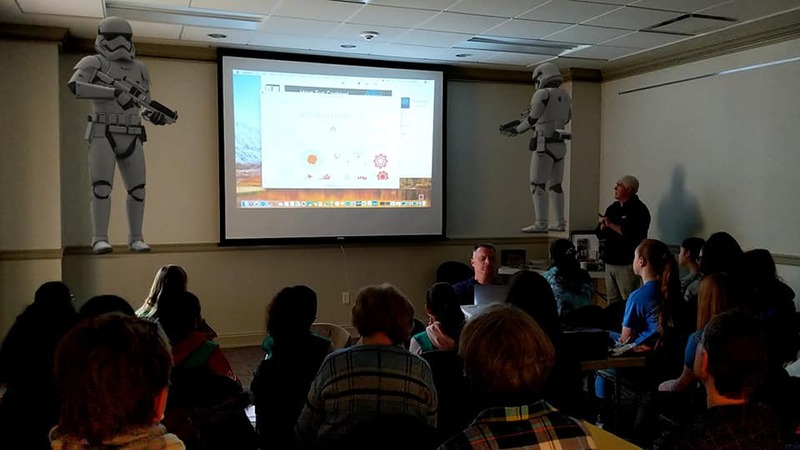 ​ We had a fun Caching through the snow 14 in February, hosted a Geo-101 at the Kemmerer Library as well as a few other events. There is a Creation Celebration event at Fud April 1st at our regular first Monday meeting, all attendees will get a HQ icon which is part of the cache carnival. The new Adventure Labs have arrived in NJ, download the new app and see Scooters Waterloo Village 5 Lab series. NNJC will be launching a 10 part series this month too. We continue to develop the 2019 "Pirates of Port Royale" Mega event, the registration will open in early April Check out the cool Pirate coin and watch for the 2019 "Golden Ticket" contest to begin in April too. Watch for upcoming details on the exciting new American Revolution Patriot geocache trail passport program across New Jersey! 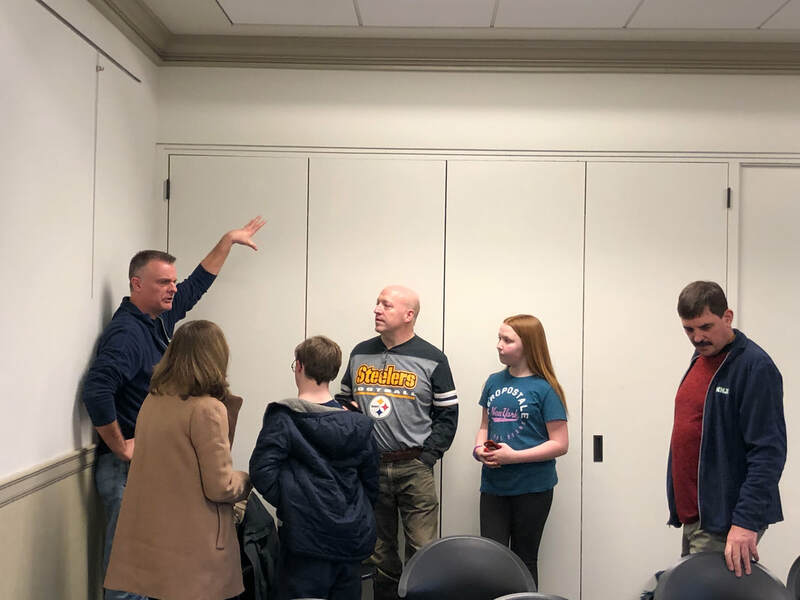 NNJC continues to grow and make new partnerships with organizations to bring quality Geocaching programs to the community. Please submit information you want included too. Stay tuned for details when NNJC launches The American Revolution Patriot geo trail across new Jersey with stops from Fort Lee to Washington's Crossing! OFF THE THE RACES ~ LET THE 2019 RACE BEGIN! YOU CAN SEND OUT THE COIN OR TRAVEL TAG THAT COMES WITH THE COIN. GOAL: This Northern New Jersey Cachers (NNJC) club COIN is in a race around the world! ABOUT: The Race will begin on May 1st 2019 with (TBD) NNJC GEOCOINS racing around the world. You must purchase a new coin, the tracking number will be registered for the race upon the purchase of your coin. ​No prior coin purchases will be allowed. All GEOCOINS MUST be dropped off in a NJ geocache to start the race. Release it and let it race! No dipping allowed by the COIN owner or their friends. Anyone can move your COIN, we don't want your friend to repeatedly moving your COIN into multi geocaches. This COIN race is to be fun and honest, everyone in the race will be watching the race progress, so simply let your COIN travel. The race will be judged by a committee and if there are any rule violations or any excessive movements by "friends" your COIN may be disqualified. You should plan to drop off your COIN in NJ by the week leading up to 5/1, but we will start the race on that date. Therefore, if your COIN moved prior to 5/1 the distance will not be counted. At 3 and 6 month intervals we will REPORT the race process. After the conclusion of the race on 12/31/19, we will award prizes for the following categories: Prizes will be determined by the number of coins sold. Get ready to join the metro gathering mega team in September as we sail into the old village of Port Royale and look for Pirate treasure! You will need to protect yourself and your family and friends. I won’t bore you with an article on what they look like, or how to remove them, or prevent getting them. I’ll let others do that for me. What's the Golden Ticket Contest? 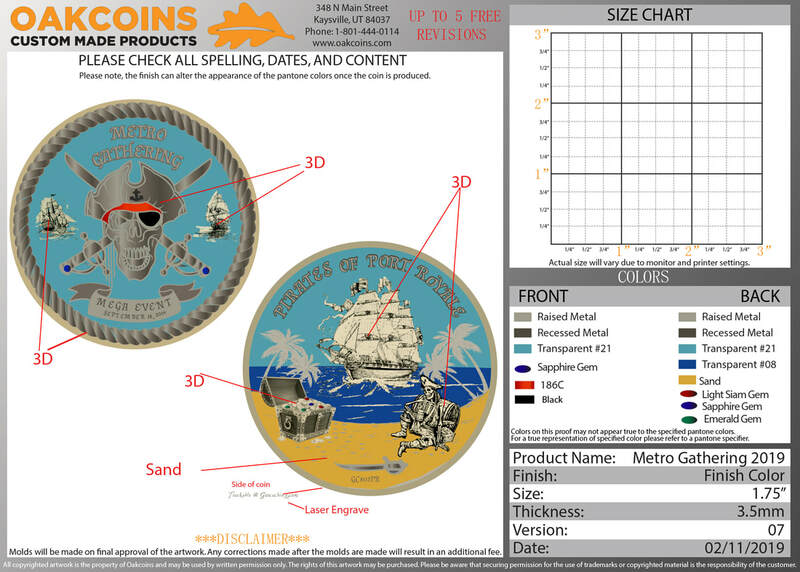 As a way to promote our upcoming 2019 Metro Gathering – Pirates of Port Royale Mega Event and give back to the local geocaching community, NNJC gives away 100 geocoins to all the lucky finders. “Golden Ticket Treasure Maps” are hidden in geocaches in the tristate area, clues are posted regarding the names of those caches on our website. Some people find them by figuring out the clues and some happen to get lucky and find them randomly while caching. There are a few wild goose chases but that’s what makes it a challenge. Let us know you are coming by posting a will attend on the cache page. This recently published cache caught my eye: Tweet, Tweet GC8313 by Ultrasound69. As stated, it is a park and grab, but really you will want to explore the contents and admire the craftsmanship. Please read the hint. It explains how to carefully open this cache. While you’re in the area, check out her other caches in the nearby park. Lynn8: How long have you been Geocaching? Ultrasound69: I started Geocaching July of 2018. Lynn8: How did you find out about Geocaching? Ultrasound69: My father is a cacher and got me interested in it and took me out on my first day of caching! Lynn8: Why did you decide to create geocaches? Ultrasound69: I decided to start creating caches because I like the creativity of it. Which is why none of my caches are the same. Lynn8: Where do you get your inspirations from? Ultrasound69: I get some of my ideas from the internet and some from my own head! Thank you for answering my questions and all those inventive caches! Want to learn more about creating caches? Share your best creation? Tell us about a really interesting cache you found? Attend a creation celebration near you. GC84657 Creation Celebration: NNJC Story Telling. Parsippany, Morris County. Come Join the Northern New Jersey Cachers, as we host and celebrate geocaching creativity and diversity around the world with a Creation Celebration event! Talk about film making in geocaching as well as the Geocaching International Film Festival. Creating a quality cache is more than just hiding Tupperware in the woods! If you're new to hiding geocaches, this educational workshop will introduce you to the most common mistakes that new cache creators make and how to avoid them. ​It's CITO season! Time to help out at our favorite parks by picking up the trash and repairing trails (and it looks like fixing a bridge, too). We have several opportunities in Central and Northern New Jersey. GC83R86 Metro CITI, Warinanco Park Elizabeth, Union County. Refreshments will be served! GC83B88 DealaMan Park CITO Trail Maintenance. Dealaman Park is located in Warren, Somerset County. A t-shirt, trash bags and water will be provided. If you plan to attend please note your T-shirt size in the log. GC83KQK 13th High Mountain Earth Day. This is located in High Mountain Reserve Park, Wayne, Passaic County. Trash bags and donuts will be provided and everyone who arrives at the event will receive an event button. GC84TMC Whittmore CITO & Picnic. 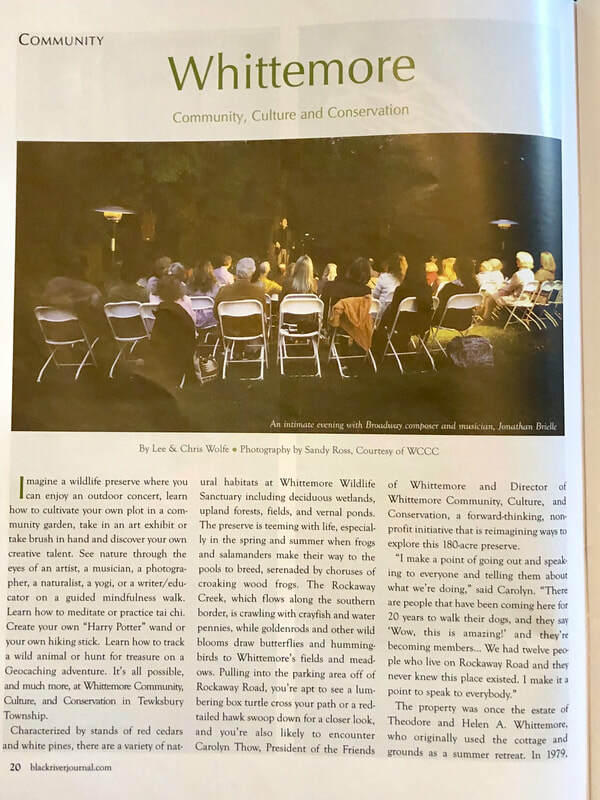 Whittmore CCC is located in Oldwick, Hunterdon County. Please bring work gloves for mulching the trails, battery powered screw drivers for repairing and building a wooden bridge. OPTIONAL LUNCH: We will supply water for attendees. Please feel free to bring a lunch, and any beverage or food and snacks to share with you fellow Geocachers! Another Night Owl event hosted by RyClops11. This (hopefully annual) event was well attended by approximately 20 North, Central, and even some South Jersey cachers (who drove 130 miles to get there). The upstairs dining room was packed with friends, food, Geochat, TB drops and TB discoveries. Let's not forget the door prizes: Geocoin, Magnetic Key Holder and a Travel Bug. All supplied by our favorite night time host. Thank you, Ryan, for another fun filled event! After a 2 year hiatus, this annual event has been revived. 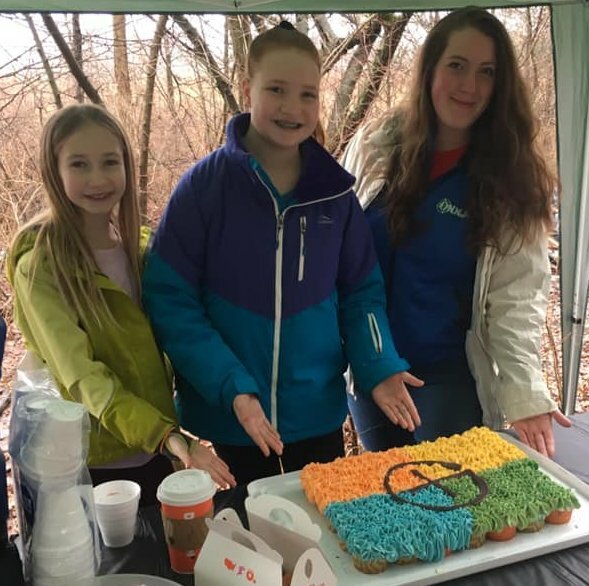 The “Winter Picnic” was held at the Great Swamp Watershed Association's 73 acre Conservation Management Area (CMA) just off Harter Road in Morristown. There was more mud than snow but the mushy terrain did not stop the 40+ attendees from enjoying a campfire (complete with S’mores! ), tasty hot cocoa, a geocache cake, and other treats. Everyone took home an NNJC bookmark created by 2nd Cup, Pip$queek and Speedy#1. There might not have been a lot of snow but there was a lot of fun! 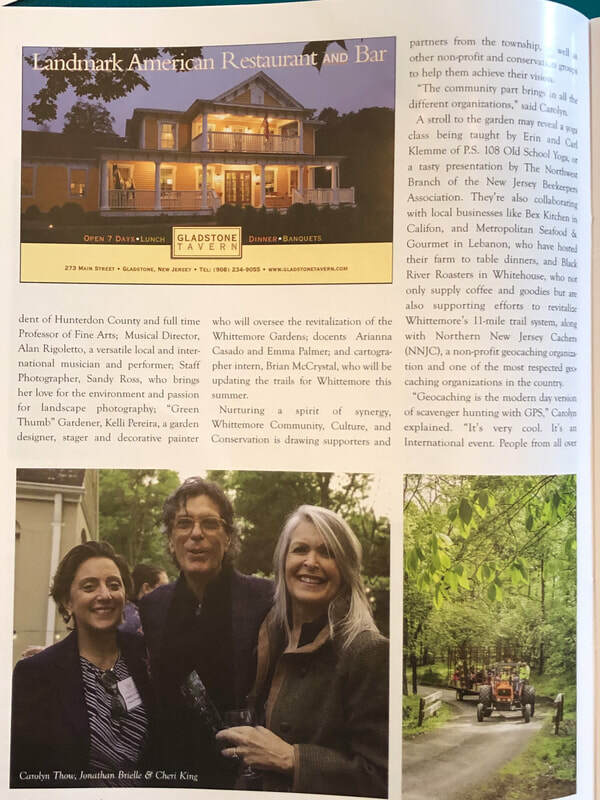 Thank you, Debbie Smith and Jen Kaufmann for all the event planning. 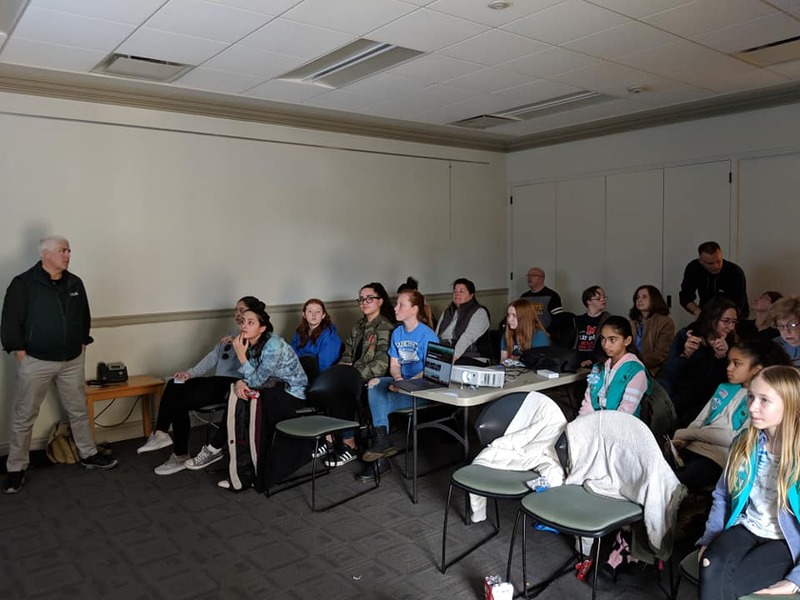 The presentation covered some of the requirements: the history of geocaching, how the satellites work, what are trackables, how to access the Geocaching Website and how to use the GPS. The troop applied this knowledge and immediately jumped into a Geocaching adventure. They found the library cache, solved the nearby puzzle cache, and discovered 3 additional caches in Bayne Park. They found SWAG, a trackable and earned their badge! Special thanks to Speedy#1, Pip$queak, 2ndCup, and Chrmdome for placing two new caches in the park to add to fun! "Send us your stories about your geocaching experiences"
When my friend started geocaching I was mortified. We’d stop in parking lots and lift light post boxes. We’d rustle around bushes. We’d rummage through planters. Wander through corporate parks searching under benches! I kept expecting to see police, security guards, or soccer moms squinting suspiciously at us. With each find my friend was ecstatic. I was cringing. Then we went to Duke Farms in Hillsborough, NJ. They have two Geotrails: TALON and Duke Farms. At last, I thought, a place where no one is going to yell at me, ticket me or think I was an urban terrorist. Duke Farms Geotrail Cache GC3E42F, is comprised of 11 caches. In the caches you will find a letter. Write it down, solve the puzzle on the flyer and when you return to the orientation center you will receive a Duke Farms path tag. You don't need to complete the Geotrails to enjoy the caches at the farm. Each cache details the history and significance of its location. The Hay Barn had burned down and a sculpture garden took up residency inside the stone walls. At the Orchid range you can stick your nose in the orchids. If you're there at the right time you can see the waterfalls spilling into the lake. I can't tell you about the TALON Geotrail GC5YE2D. I haven't started it yet but I have it all mapped out! Geocaching began in 2000 when GPS coordinates for the first documented cache location in Oregon were posted online. Nearly two decades later, more than 3 million active geocaches are hidden around the world and published on websites. New Jersey alone has thousands! 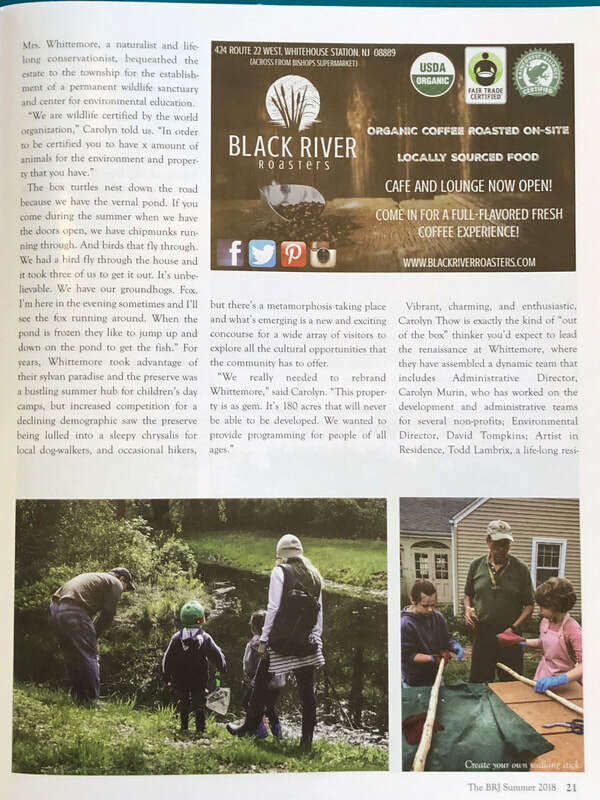 Some parks even have dedicated geocache trails, like the one created by the Northern New Jersey Cachers club at the Whittemore Wildlife Sanctuary and Arts Center in Tewksbury Township. 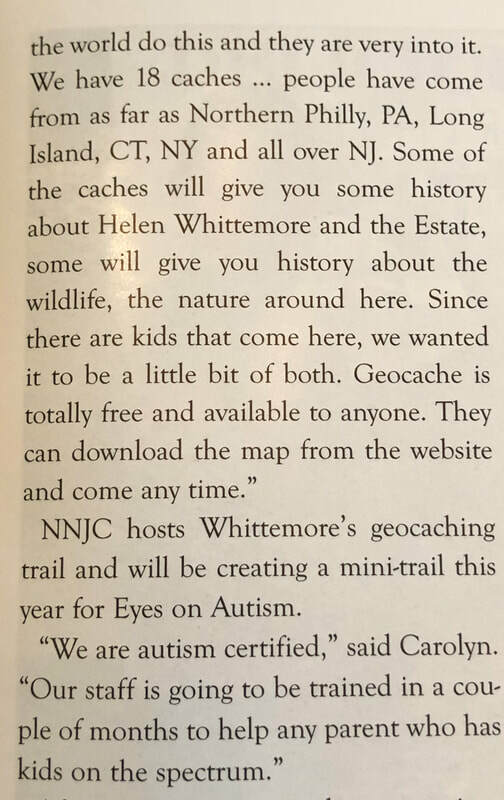 This is the Cablevision TV video of the Northern New Jersey cachers, (NNJC )members presenting Geocaching and community service, filmed at the Great Swamp WaterShed Asso (GSWA), Conservation Management Area 5/7/12. Check out the new NNJC eBay.com store for many available NNJC coins and pathtags! ​PHOTO'S OF OUR MEMBERS ENJOYING LOCAL GEOCACHING! The Sanderson Sisters roaming the Witches of Salem Mega village We had another record turnout at the 5th Annual MetroGathering.org Mega event, "The Witches of Salem" on 10/20/18. We also launched the 2nd annual "Golden Ticket" contest with 100 lucky finders received a limited Geocoin! Stephan and Eric setting up the Tunnel Lab Cache! This past November, almost 18,000 geocachers attended Geocaching International Film Festival events. From movie theater seats and living-room couches, geocachers all around the world celebrated the 16 GIFF finalist films. What do you come across while Geocaching? We will feature your videos and photos of the interesting, unusual, strange and funny things or places you come across while out on your Geocaching adventure! ​2018 memorable geocaches found during this past year that others may find that inspired you.The following list - include GC number, name, type of cache, where it was located, and why special. ​1) GC1CYZC - American WWII Aircraft - B29 Super Fortress in Randolph, New Jersey. Puzzle Cache. This was culmination of finding 23 geocaches in the series to find a whopper of an ammo can! Great history on the cache pages! Traditional Cache. Probably one of the most favorited geocaches on the east coast. Just plain fun! 3) GC3JAY4 - Tin Man just northeast of Albany, NY. Traditional cache. Great workmanship. Theme geocache. CO a great guy if you meet him. 4) GC6KFT3 - History at the Lenox Library in Lenox, MA. Puzzle Cache. Awesome old, historical library. Fun field puzzle stages inside of the library! 5) GC7B840 - US History: Saratoga Monument & Victory Woods, in Saratoga NY. Virtual cache. National historical monument. One of the tallest obelisks in NE. Lots of history, and park personnel will give you a tour! And you get to climb to the top! 6) GC650VC - Indian Echo Caverns, near Hershey, PA. Earth cache. Privately owned caverns that provide guided tours. Very nice. Especially on a hot summer day! Ordering a new pathtag this year? Please consider choosing the NNJC back during your back selection. This is a fund raiser and proceeds will go to support NNJC! Samples are shown in different metals. We now have a new Log in / Registration tab for anyone who wants the join NNJC and become a member. This is also for existing "members" please register your information! After you register you will then receive an email and become​ a member. Please note this email will be within a week or sooner. ​We are working on many improvements to the NNJC website and are always looking for volunteers! If you would like to join and volunteer some time to assist with website development, content, photos, articles, newsletter, we could use your help! ​Please submit through the contact us link! We are planning on implementing a new updated newsletter in 2019 to keep you updated on many exciting NNJC events and features. We ask you to become involved and submit your stories, photos and we'll include them each month! We are also working on enhancing the NNJC membership with better communications, and information. Check out the NNJC Calendar for updates on future events, road trips and travels. We are always working on many great adventures for our members, friends and families. We are now working on our 2019 Calendar, let us know if you have an idea for an event or travel. Please send in your photo's! 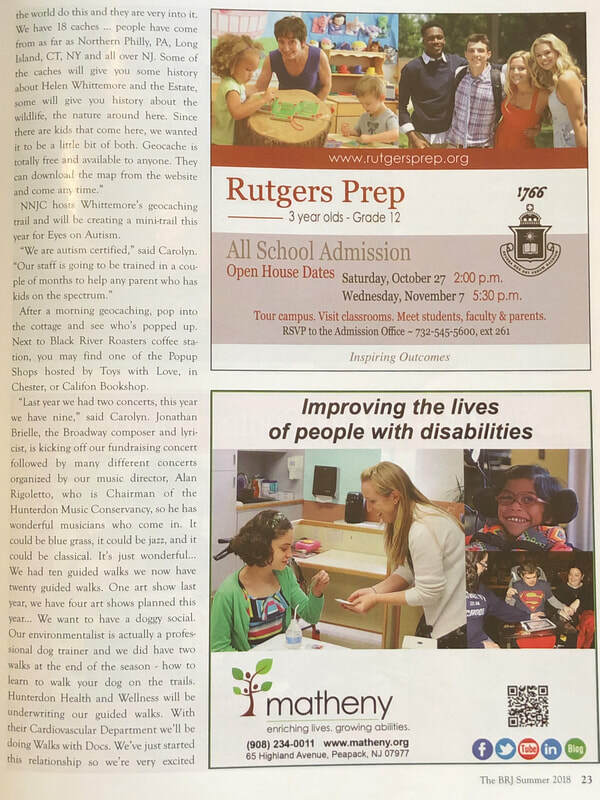 NNJC is about promoting a quality caching experience in New Jersey.